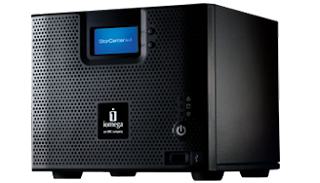 This tutorial uses unsupported features of the IOMEGA Storcenter ix4-200d. It worked for me but use it at your own risk! It should work (again, it is unsupported) on the ix2 Storcenter as well. to see the partitions and their mountpoint. The idea seems to be that third party programs should be installed in the /opt/ directory, which has ample storage (16GB) whereas root (/) only has 50MB. to build the list of available packages. The problem of this setup is that you won't be able to install some packages because installation will fail because part of the filesystem is readonly. This installs the binary /opt/bin/ipkg-opt. The idea is then to use this binary instead of the regular ipkg: as a result all packages will be installed in /opt/ and you won't run into problems with the read only filesystem. Note: this is not persistent (if you start another shell, you will need to do that again). at the end. That's the main problem with /opt installed software: you might end up to get duplicated libraries between /lib and /opt/lib (ldd and ldconfig are your friends). If you want a full gcc toolchain to compile your own applications from source. Unfortunately, you will soon discover that some of the packages you want are not available for ipkg. Note2: be careful to choose packages compiled for your architecture (armel in my case)! The above command will install your soft as if /opt/ was the root directory (you will end up with /opt/usr/lib directories and the like). As a result, you might need to add stuff in your PATH or edit /etc/ld.so.conf. Don't forget the --prefix=/opt to specifiy you want to install your package. When compiling from source, you run into the usual complation problems you can get with linux (libraries/includes not found etc...). It gets even more annoying because default stuff does not work well anymore (package manager is not where expected etc), and sometimes you end up having to specify the complie flags yourself. It seems like I forgot a step... sorry about that. I changed the numbering. You are right about the need to do update before doing install for ipkg-opt: I updated the post. You are also right regarding the optware pacakage: it does not exist... I updated the post as well. Thanks for improving the post! once again thank you for this and other posts! other things it can be perfect to install in the NAS is a SVN server. I am not sure it works as I don't use the package myself... let me know if you get an error message. you need to put 0.0.0.0 so that the web service can be accessed from other computers (it is just accessible locally otherwise). did you try to use /opt/bin/python intead of just python (which is the one installed by iomega)? .. but the package is there ...any idea ? from the command line and tell me if you get a more detailed error message? It's working I changed to de /opt/bin and executed with ./ipkg-opt install lighttpd and it's working ..
No idea why, yesterdaf this wasn't working .. but perhaps I made a mistake. So , no need to investigate but my respect for the quick effort to help !!! I've followd this thread but i have some problems after restarting nas. 1st i've to manualy start "etc/rc2.d/S99Sickbeard.sh start"
I suppose you have an IOMEGA storcenter. 1. did you look at my tutorial: http://vincesoft.blogspot.com/2012/01/how-to-run-program-at-boot-on-iomega.html ? 2. all the config files have to be in /opt : most of the file system is cleaned/refreshed on reboot. where were the files that are gone? 3. are you saying that /opt/bin/unzip is gone? if you are just typing unzip at the invite, make sure /opt/bin is in the PATH (to do that, PATH=$PATH:/opt/bin). I don't have unrar on my system, but I guess the problem is the same. after editing the sohoprocs the ix4 wont but up anymore and hangs on 75%. I can restore from usb stick and it wil work again. tried it several times now als i with other firmware but stil crashes at 75%. 3) where exactly do i put the path command? if i do this in cosole and i close the console, the patch is gone after reboot. 2)if the path is set, the programs wil work. but settings still wont be saved. the files are in /opt/. 2. that's strange. were you able to override the location of the setting file to /opt ? If you stop the process and restart it without rebooting the NAS, are your settings ok? I dont suppose there is a way to get a vpn server running on this box? but I don't know if that's really a problem. is there a way to install a NZB-Grabber or Usenet-Client or something? I don't want to mess up my system because I am not _that_ good on linux boxes. somebody tried to install "autosub" from bierdopje.com to install on the ix4-200d. i've managed to install sichbeard + sabnzbd with these tutorials but if someone can write a tut to install autosub as wel? You can actually install the MySQL Server for ix4-300d lifeline app. It seems to work fine on my ix2-dl, I just need to figure out how to configure remote access. dpkg: serious warning: files list file for package `openjdk-6-jre-headless' missing, assuming package has no files currently installed. dpkg: serious warning: files list file for package `openjdk-6-jre' missing, assuming package has no files currently installed. I can't get past the last part of step 3. I don't have the cloud edition. Its a problem with libidn.so.11? Can I install this manually? On the Standard edition (not Cloud) you also have to install libidn!!! "4. Install utilities and optware-devel"
Failed to download libidn. Perhaps you need to run 'ipkg update'? I try to configure my ix4-300d NAS as a SVN Server, but i am not sure how to do it. It is possible with this device, or it is better if i buy a diffrent hardware? If I update to latest firmware I have to do again this installation?